The Montgomerie course at Marrakech Golf City lies at the heart of a huge 500-acre residential project that’s taking shape on the outskirts of the Red City under the direction of The Prestigia Group, one of Morocco’s foremost real estate developers. 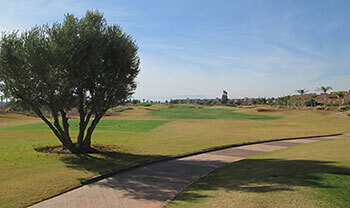 Designed by European Golf Design and Colin Montgomerie, the 18-hole layout was constructed in collaboration with Moroccan-based contractors STAM and Valtech on a joint venture basis. The property, which was once part of a large olive grove, lies close to the airport and the city centre, and Open Golf Club, which has many years of experience operating similar golf facilities in Belgium and France, manages the facility. The clubhouse caters for non-golfers, with local people encouraged to enjoy the use of its two gourmet burger bars and the Jeep-sponsored rooftop JSet SkyBar, which features a lounge, restaurant and “ice bar”. Out on the course, golfers teeing off at the 1st take aim towards the 250-feet high minaret of the 12th-century Koutoubia Mosque, in the southwest medina quarter of the city. After the opening hole, a road tunnel then allows access to the next seven holes, a sequence that ends with the very short par three 8th, played across water to a two-tiered green. On the back nine, water doesn’t come into play again until the 375-metre 17th, where a sizable, triple-fountain lake protects the front left side of the green. Although there’s another large body of water in front of the clubhouse, it’s located well to the left of the home green, so it doesn’t really impinge on golfers completing their round. First of all, no review of The Montgomerie would be complete without some sort of comment about the multi-storey clubhouse – it has to be one of the biggest I’ve ever been in, housing a couple of burger bars, a car showroom (!) and a nightclub on the top deck. On the course, I was pleasantly surprised with how well the holes had been shaped, with the designers somehow managing to create contours that didn’t exist before the bulldozers moved in to fashion the rolling fairways. Water holes have been kept to an absolute minimum (on holes 3, 8 and 17) which is a big plus in my book, and there’s ample width on every hole, allowing plenty of latitude for wayward shots. Apart from the general high quality of the build, the main highlight for me was the composition of the greens, which have been constructed with some sensible contouring, unlike a lot of new courses which rely on wacky greens to create golfing interest. There are a couple of tough back-to-back par four holes on both nines: the raised green and two-tiered green on the 5th and 6th causing potential problems on the outward half, whilst the low stroke index of the 14th and 15th ( S.I. 2 and 1) speaks for itself. I understand from Nicolas Barraud, the club’s amiable Director of Golf, that Open Golf Club, which currently operates The Montgomerie, will be opening another 18-hole layout in October 2016 at the nearby Argan Golf Resort, featuring Tony Jacklin as the headline architect. As this will bring the number of golf facilities in and around the city to a round dozen, I wonder at what point will this golfing destination reach its saturation level?